That was plenty of offence for Jaroslav Halak, who stopped 25 shots in his home debut for Boston to help the Bruins win their third straight. Halak didn't allow anything past him after McDavid blew through the Boston defence and slipped one in at 3:43 for his first goal of the season. "We didn't create a lot of offence and when we finally did, the bounces didn't go our way," Edmonton coach Todd McLellan said. "I thought we had the start that we wanted to have." Patrice Bergeron added an empty-netter in the final minute and finished with a goal and an assist. Defenceman Matt Grzelcyk had a pair of assists for the Bruins. They have won three straight since getting shut out by Washington 7-0 in the season opener. 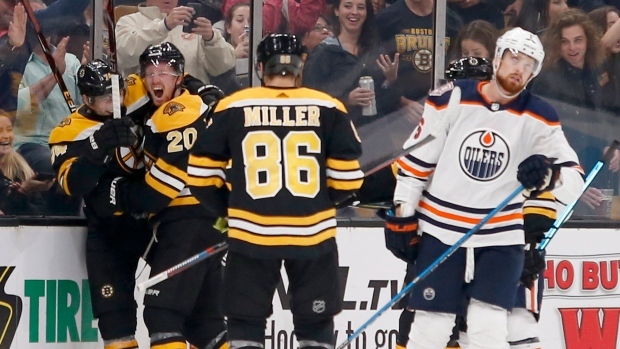 After Pastrnak tied it on a power-play goal, slipping the puck between his own legs and beating Talbot with a backhand, Marchand gave Boston its first lead at 14:37 on another power play off a centring pass from Grzelcyk. Nordstrom scored again for Boston 36 seconds later on a give-and-go with Krejci.